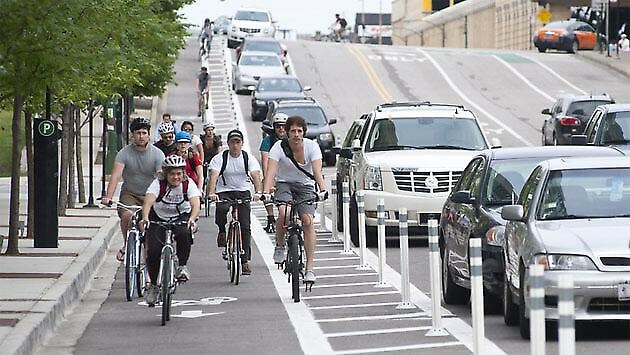 Photo courtesy CDOT via Streetsblog Chicago. You can cite studies showing that for every quarter-mile a home is closer to a low-stress bikeway, its value goes up $510. But that's not the same as catching it in action. I didn't immediately know why this unassuming profile on a Chicago real estate blog, of a new 36-story luxury apartment building just outside the Loop, would have popped up in my scan of recent news about protected bike lanes. Then I got to the "transportation" section of the description and saw that the profile writer had devoted three photos in the profile to the building's access to "a protected bike lane path that provides quick access to River North, the Loop, Wicker Park and Bucktown." The author of this piece, Joe Zekas, may not have his terminology quite solid yet, but he's referring to Chicago's new mini-network of better bike lanes: Kinzie Street, Milwaukee Avenue and Dearborn Street. Zekas didn't mention the nearby conventional, painted bike lane on Halstead that provides quick access to Lincoln Park, or the conventional lane on Clinton that connects to Union Station. Rightly or wrongly, paint-only lanes are afterthoughts here — just like the unspecified "number of CTA bus routes" at which Zekas waves vaguely after describing the local rail connections in detail. Real estate writers aren't ideologues, and Zekas isn't going out of his way to cheerlead for physical protection of bikes. What he's doing is using his experience and his gut to describe the relevant amenities of a luxury apartment. He's using emotional intelligence, not cold logic. That's what informed his decision to mention the protected bike lanes nearby. And the truth is that people tend to see protected and buffered bike lanes as important and useful in a way that painted lanes aren't. That's not something science can fully explain, at least not yet. But it's what's happening.